I admit that we're all pretty nerdy here at AP and we obsess over things that most people don't even consider. But we do it for all of you. One thing that some of us, especially Artem, want to know is how fast a particular charger/cable combination charges. Power meters were designed just for people like us, but I am here to show you what the folks at Satechi have cooked up. 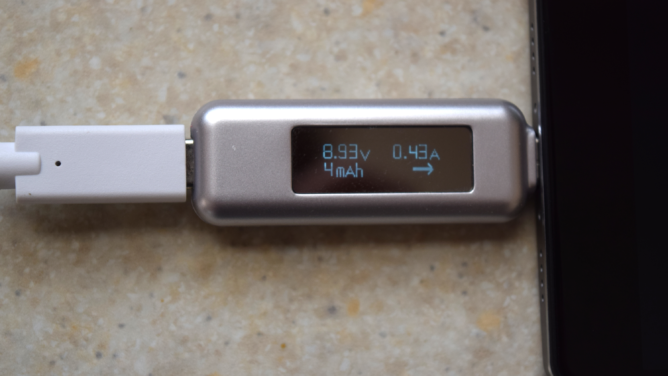 This one is a USB-C power meter (model number ST-TCPM), which was designed to complement the increasing number of Type-C devices hitting the market. What's nifty about this little guy is that it takes advantage of the bi-directional power flow in the Type-C spec, which means it can meter the electricity from both directions. 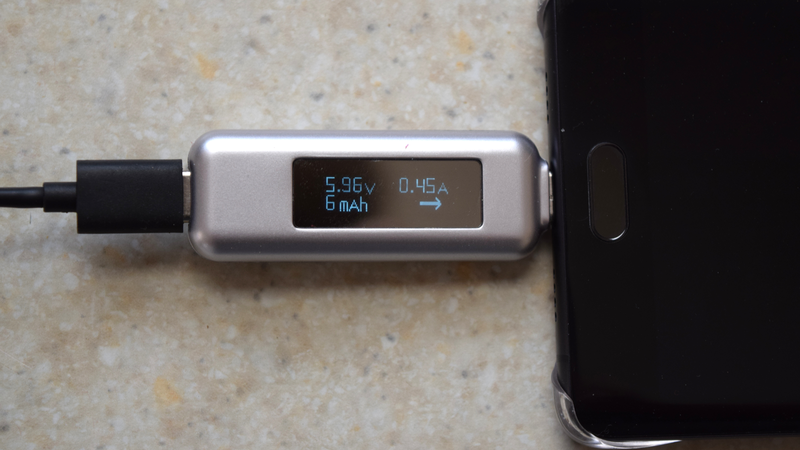 So if you've wondered at what rate exactly your USB-C phone, tablet, or whatever is charging, then this is for you. Just remember that if you are planning on purchasing one of these, this power meter does not function as a protection circuit. That means that terrible, unsafe accessories will still be terrible and unsafe. Continue to exercise caution and good judgment to preserve your devices. 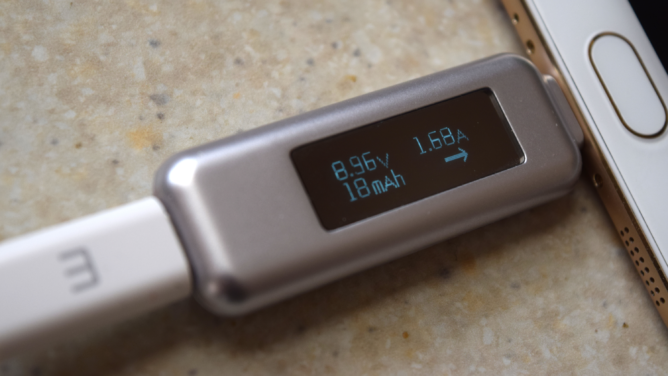 At first glance, the Satechi meter looks like it's made out of aluminium. Sorry to say that it's not. The plastic shell is coated with an aluminium finish and it feels rather flimsy. Ever since I removed mine from the shipping materials, I have been afraid to drop it or squeeze it too hard. That's not to say it will shatter if a feather falls on it, but I have erred on the side of caution in my use. Basically, don't flex this thing. 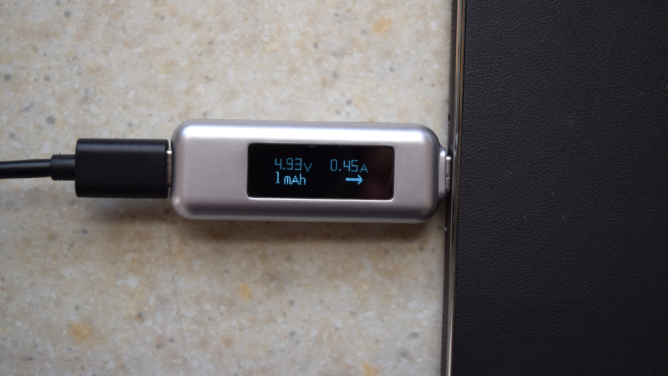 For being a device meant to be plugged/unplugged multiple times to test several devices and power readings, the connections feel relatively solid. The male end takes a bit of wiggle to dislodge, though; when disconnecting from my tablet, I have felt it bite a bit too hard. However, like handling the power meter overall, I have erred on the side of gentleness when plugging and unplugging the connections. The screen, where you actually get the readings, is bright and clear enough to read even in direct sunlight, though the viewing angles are not the best. It'll take a few seconds to turn on once power is applied and once it's up and running, it will display voltage, current (amperage), and total mAh usage. As far as actually using the power meter, it's pretty darn simple. Plug in a charging cable to the female end and then connect the whole thing to whatever you want to charge. 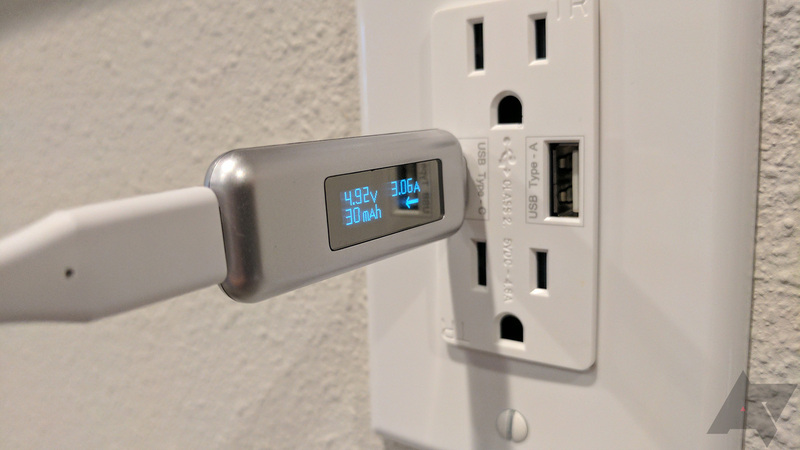 Or you can do what Artem did and plug the meter into your charging block or outlet, then plug in your Type-C USB-PD cable (Nexus/Pixel) and charge from there. Same concept and does the same thing. The electricity passing through will be measured in a very short time, but I typically wait a few more seconds to make sure it catches up to the total power flow. And that's about it. Using the meter is simple and it gives you some basic, but good, information. There are quite a few fast charging standards on the market that manipulate things in various ways to accomplish the same goal: charge your battery really fast without blowing it up. That involves a lot of engineering to do something so seemingly simple. 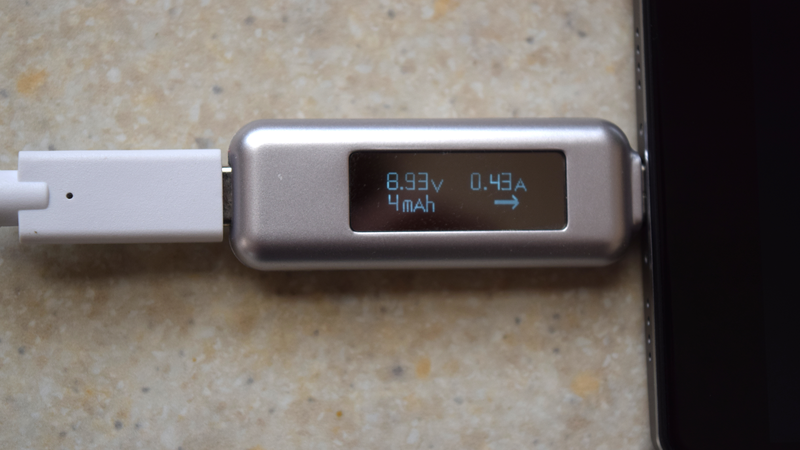 I like power meters like this one for the simple fact of verifying that my devices are charging at the rate they're marketed at. Unfortunately, I do not have examples of every quick charging technology, but I have a few laying around. I've put what I have below, just to show you how this power meter works. There really isn't much more to say. The Satechi USB Type-C power meter is a neat little gadget to have if you're interested in the current passing into your phone or other devices. Admittedly, it appeals to a certain person, but that's neither here nor there. We have an exclusive deal for you guys so you can check one out for yourself. Just head over to the Satechi website and use the code "AP20" or go to the Amazon page below and input "WD6FMOPC" (here are the terms and restrictions, in case anyone is curious) at checkout to save 20%. That'll knock off about $6 of your total (MSRP is $30). Just a fair warning, as of this writing, Amazon is showing that there won't be more stock until Monday, March 20.